DEM L50 is a so-called superbubble found in the Large Magellanic Cloud. Superbubbles are created by winds from massive stars and the shock waves produced when the stars explode as supernovas. This composite of DEM L50 features X-rays from Chandra (pink) and optical data (red, green, and blue). This composite image shows the superbubble DEM L50 (a.k.a. N186) located in the Large Magellanic Cloud about 160,000 light years from Earth. Superbubbles are found in regions where massive stars have formed in the last few million years. The massive stars produce intense radiation, expel matter at high speeds, and race through their evolution to explode as supernovas . The winds and supernova shock waves carve out huge cavities called superbubbles in the surrounding gas. X-rays from NASA's Chandra X-ray Observatory are shown in pink and optical data from the Magellanic Cloud Emission Line Survey (MCELS) are colored in red, green and blue. The MCELS data were obtained with the University of Michigan's 0.9-meter Curtis Schmidt telescope at Cerro Tololo Inter-American Observatory (CTIO). The shape of DEM L50 is approximately an ellipse, with a supernova remnant named SNR N186 D located on its northern edge (roll your mouse over the image above for labels). Like another superbubble in the LMC, N44 (see last year's press release), DEM L50 gives off about 20 times more X-rays than expected from standard models for the evolution of superbubbles. A Chandra study published in 2011 showed that there are two extra sources of the bright X-ray emission: supernova shock waves striking the walls of the cavities, and hot material evaporating from the cavity walls. The Chandra study of DEM L50 was led by Anne Jaskot from the University of Michigan in Ann Arbor. The co-authors were Dave Strickland from Johns Hopkins University in Baltimore, MD, Sally Oey from University of Michigan, You-Hua Chu from University of Illinois and Guillermo Garcia-Segura from Instituto de Astronomia-UNAM in Ensenada, Mexico. 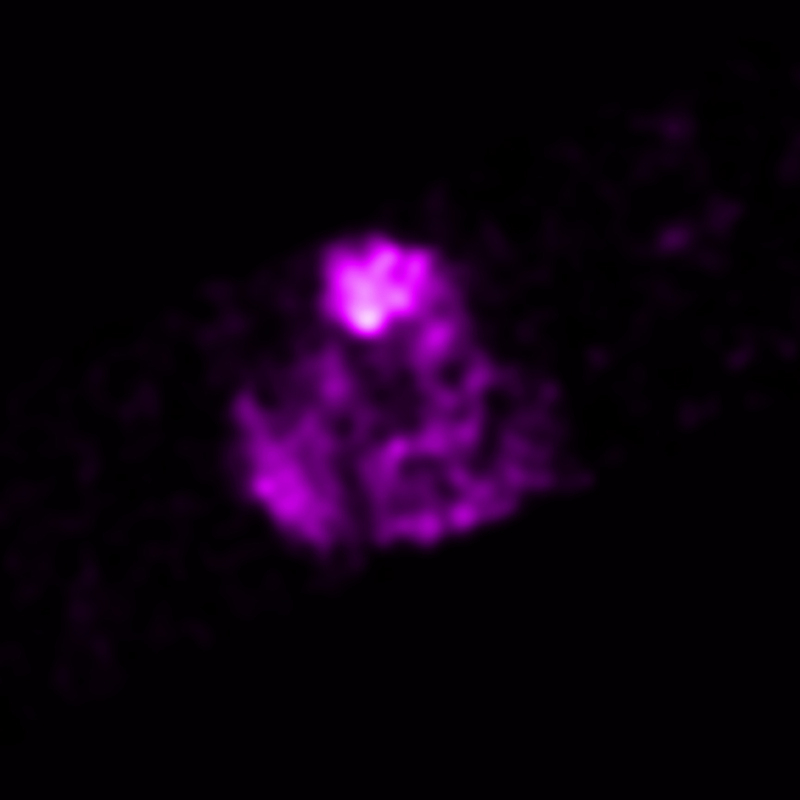 Coordinates (J2000) RA 04h 59m 49.00s | Dec -70° 10´ 28.00"
A wonderful image from our neighboring satellite galaxy. 160,000 light years from Earth. 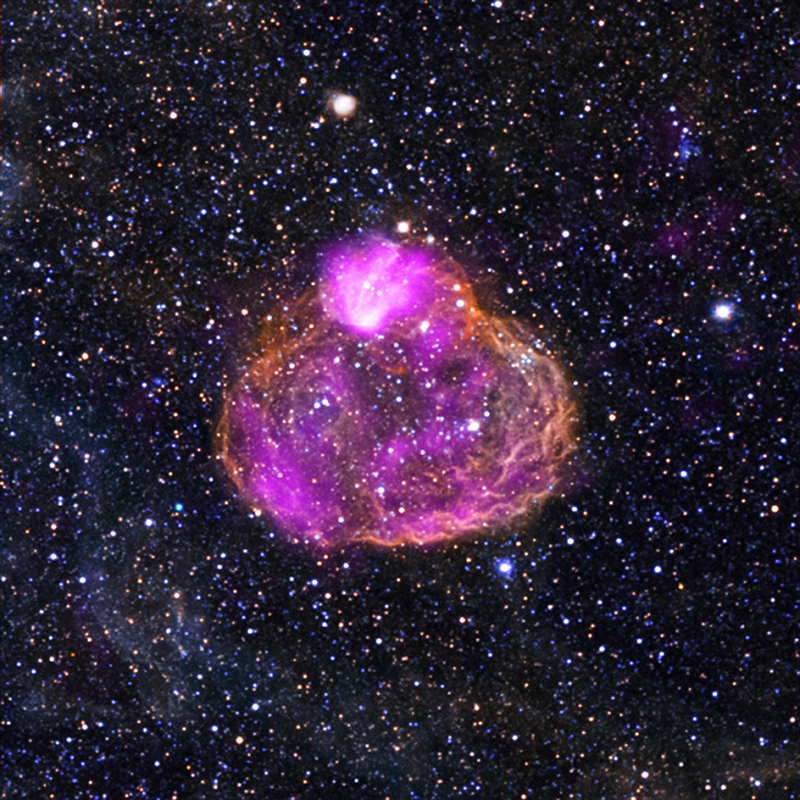 Combining X-ray data from Chandra and optical data from the Magellanic Cloud Emission Line Survey (MCELS). About 950 light years across. X-rays are magenta and optical red, green and blue. In the constellation Mensa in the Southern Hemisphere.